“Car people” have been the foundation of Barrett-Jackson since day one. Here are the stories of those who made the company what it is today. Tom Barrett loved collector cars, and was a born “wheeler dealer” with a flamboyant style. For nearly three decades, “La Paz” – Tom’s estate in Paradise Valley, Arizona ‒ would see many thousands of the world’s greatest automotive masterpieces pass through its gates, and it became the place where collectors from around the globe would travel to roam the garages and barns to inspect the rare, classic cars and deal with the fearless man with his distinct showmanship style. 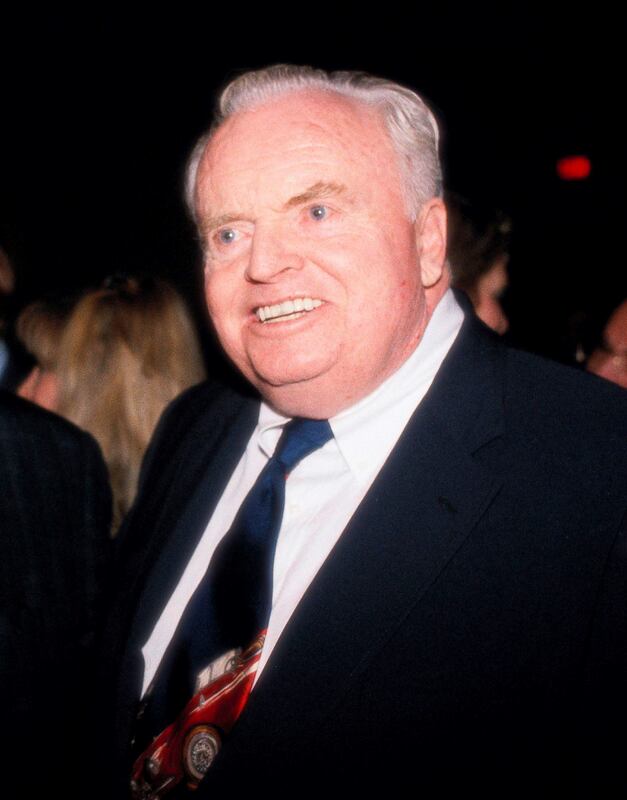 Born in Oak Park, Illinois, Tom moved to Arizona in 1960 to become a real estate broker. Tom’s enthusiasm for cars was fueled at an early age ‒ despite the disapproval of his father, a federal judge in Chicago, who wanted him to become a lawyer and thought his fascination with automobiles was not professional. Already a car collector at the age of 19, he used his enjoyment of classic cars in helping establish real estate business contacts with other collectors throughout the country. Tom’s passion for collecting cars, combined with his showmanship style, would soon become his main business, and he would travel the world searching out grand cars that would later be recognized as some of the very best, rarest and most expensive classic automobiles. 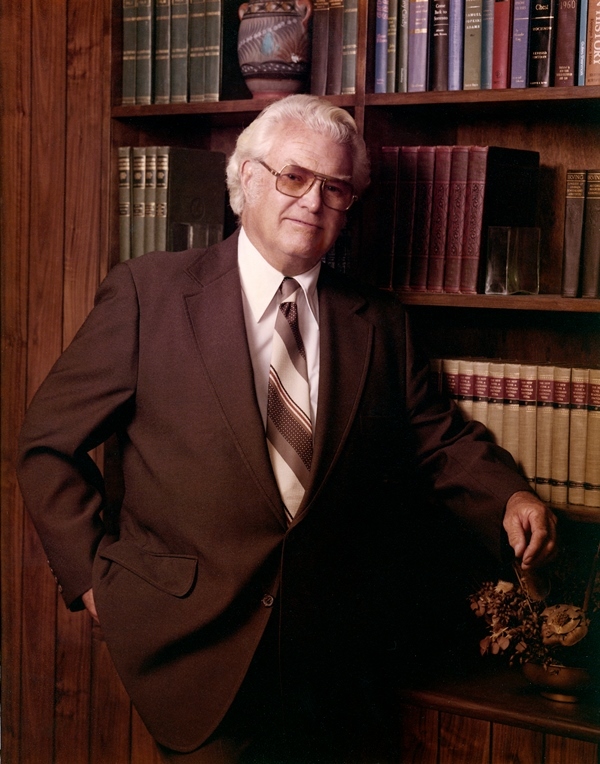 Known throughout the world as an authority on values of great cars, Tom would earn the reputation as the “Grandfather of the Collector Car Industry,” with his fingerprints on nearly every major classic car in existence. Tom’s lifelong love of classic cars was evidenced by his long-term support of the Classic Car Club of America. In 1989 the CCCA named the restored two-story antique barn at the Gilmore Car Museum in Kalamazoo, Michigan, the Thomas W. Barrett III Barn in Tom’s honor. Although known for his love of classic cars, Tom’s enjoyment of all things automotive would see him become involved in the world of Indy car racing in the 1980s, having his own team in 1981 and being a sponsor at the Indianapolis 500 for a number of years. In 1963, Tom placed an advertisement in the newspaper for a 1933 Cadillac Town Car. The respondent? One Russ Jackson, who loved old cars, especially old Cadillacs with big 12- or 16-cylinder engines. Although the deal never materialized, the two formed a bond over their common interest and, a few years later, formed the Barrett-Jackson Auction Company. Born in Michigan, Russ Jackson grew up in Pontiac and attended General Motors Institute in Flint before becoming a salesman with local car dealerships and a member of the Pontiac Fire Department. Russ married Nellie Jackson in 1940 and joined the Air Force a year later as a member of the ground crew, working his way up the ranks to Chief Mechanic. Wanting Nellie to remain at his side, Russ made sure Nellie served as an accountant wherever he was based, including bases in Gulfport and Biloxi, Mississippi, as well as in California. Accommodation at some of those bases was at times less than stellar; Craig Jackson remembers stories of his father living in a chicken coop while stationed at Victorville, California. After World War II came to an end, Russ owned and operated the successful Russ’s Country Store just outside of Pontiac from 1946 to 1960. The Jacksons moved to Arizona that same year, seeking a drier and warmer climate because of Nellie’s arthritis. The family had been regular vacationers to Scottsdale since the mid-1950s, spending time at the Vista Bonita Ranch near Pinnacle Peak. But the time had come to make a permanent move. Russ, Nellie and their sons – 14-year-old Brian and 1-year-old Craig – packed up everything and began the long drive in a three-vehicle caravan. Once settled in Arizona, the couple opened the full-service Super Car Wash, where they secured a contract to wash Scottsdale’s police cars, and also did prep work and car washing for local auto dealerships. In addition, they owned and operated the Classic Carriage House, where they bought, sold, rebuilt and refinished classic cars. Nellie was born in the automotive town of Pontiac, Michigan, with her first office job being in the cost accounting department at Fisher Body, a division of General Motors. Her affinity with classic autos began when she and Russ purchased a 1934 V12 Cadillac Opera Coupe from a junkyard they passed while on vacation. The car moved with them from Pontiac to Scottsdale, where they became very active in the Classic Car Club of America. Nellie served as treasurer and was later elected as the first female Regional Director of the club. During the mid-1960s, Nellie’s everyday car was a 1937 Cadillac V16 limousine, the first of many collector cars she owned and drove daily. She received the prestigious Meguiar’s Treasure of the Collector Car Hobby award at the Hollywood Kodak Theatre in June 2004. 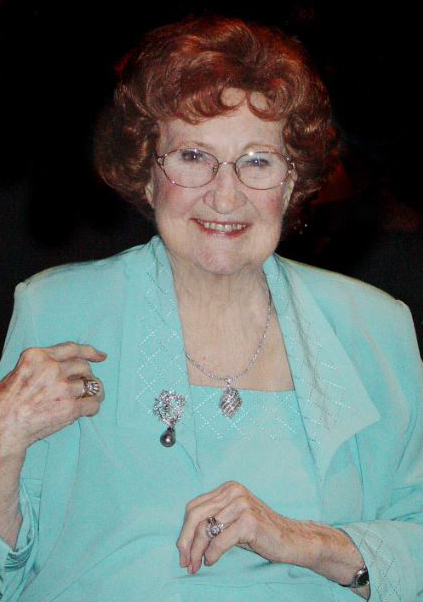 Considered the matriarch of the Barrett-Jackson Auction Company, Nellie Jackson served as Executive Director for many years. Her passion for automobiles and business acumen were a driving force behind Barrett-Jackson’s evolution into the world’s leading collector car auction company. Along with her husband, Russ, and Tom Barrett, Nellie co-founded Barrett-Jackson and held an executive position with the company since the doors opened in 1971. Don remembers how Nellie was always “the first to get to work and the last to leave.” He recalls trying to beat her to the office sometimes, but was never successful. “She had a passion for the hobby and the business,” he says. “She possessed an amazing attention to detail and had a remarkable, even phenomenal, memory.” Apparently it wasn’t uncommon of Nellie to recount the ownership history of all significant collector cars, whether they’d been sold at Barrett-Jackson, at other auctions or through private sales. “My mother was the foundation who grounded everyone at Barrett-Jackson with her wit, wisdom and caring spirit,” says Craig Jackson. The Jackson’s oldest son, Brian, was born in Biloxi, Mississippi, where Russ was stationed in the Air Force during World War II, Brian Jackson naturally inherited a love of cars from his parents. His first car was a 1936 Ford that remains a treasured vehicle in Craig Jackson’s personal collection to this day. Growing up in the era of great muscle cars and race cars, Brian developed a passion for SCCA and drag racing. Craig remembers Brian spending a year traveling around Europe and the United States with Jim Hall of Indy car fame and builder of the winged Chaparral race cars. Needless to say, by the age of 26, Brian was already well-indoctrinated into not only the racing world, but the collector car world when his father partnered with Tom Barrett to form the Barrett-Jackson Auction Company in 1971. He became an intrinsic part of the company early on. When he wasn’t helping out at auction time, however, he usually could be found at a racetrack – including the Beeline Dragway in Mesa, Arizona. Many times he raced his treasured 1965 Shelby GT350; Brian was among the first to become involved in vintage sports car racing in the mid-1970s and often raced at the Monterey Historics. His spare time would be spent at his race shop in Phoenix, where he and his friends worked on their cars. Brian took over management of Barrett-Jackson in the early 1990s while Russ Jackson struggled and then passed away in 1993 from colon cancer. A year later, in 1994, Tom Barrett retired from active participation in the auction, leaving it formally in Brian’s hands. 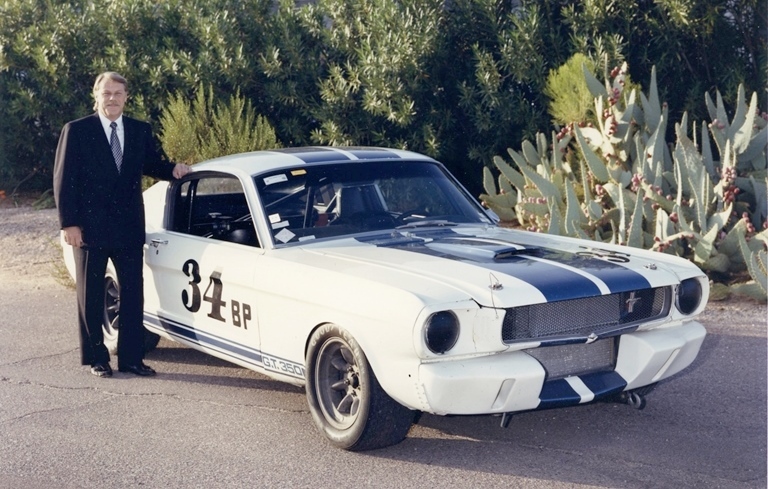 Brian Jackson with his 1965 Shelby GT350. Brian and Craig had often talked about what changes they might make when they ran the company. The discussions mostly centered around creating the ultimate car lifestyle event, one that lovers of the classics and new car enthusiasts could all enjoy. In 1995, the brothers made one of many major steps in enhancing the lifestyle aspect of the auction experience by signing Detroit “Big Three” automaker Chrysler as the first presenting sponsor of the auction. As part of its sponsorship, Chrysler set up a huge product display that included not only the company’s latest portfolio of vehicles but many of its historic classics. Like his father before him, Brian sadly succumbed to colon cancer in 1995. 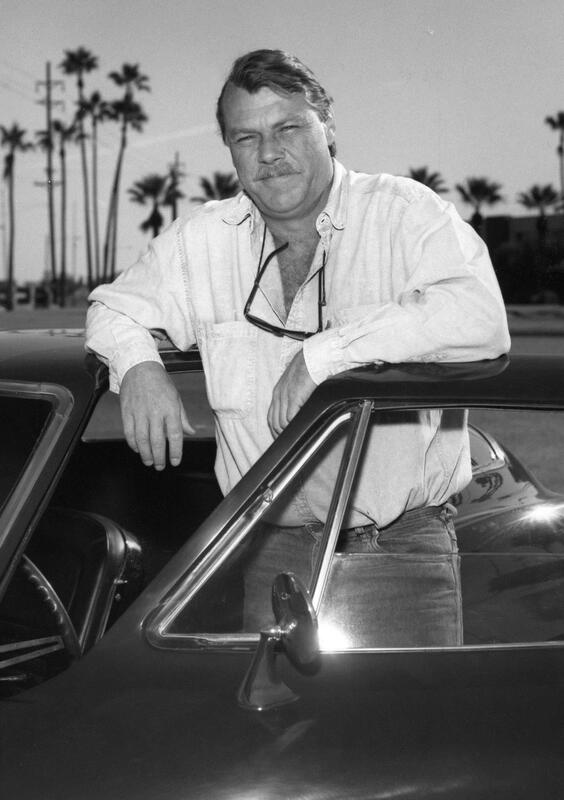 Friends and fellow collector car enthusiasts remember him as an honest, hard-working man who was dedicated to the car hobby – a dedication that continues to influence the Barrett-Jackson team to this day. That serendipitous meeting between Tom Barrett and Russ Jackson back in 1963 emerged into a partnership that would create one of the world’s most prestigious classic car auctions. Their initial enterprise was to set the tone for what would become the Barrett-Jackson legacy.